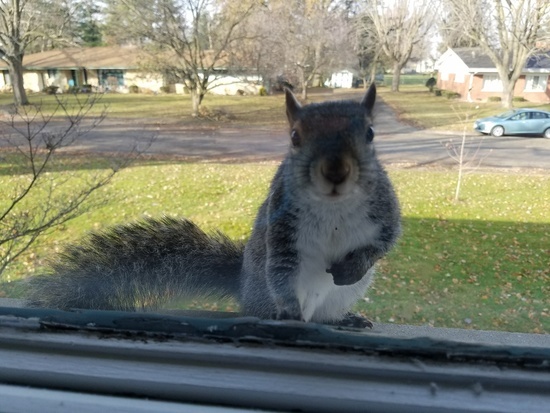 This entry was posted in Uncategorized and tagged squirrel peeking in window. Bookmark the permalink. Thanks, Virginia. It’s just good fortune when I see what could be an interesting shot … and happen to have a camera at hand, ha! The world needs more squirrel photos, with or without commentary. That said, there’s no critter more curious than a squirrel, and you’re right that we all could use a little more of that quality! Isn’t he cute?? He was just about a foot away from me on the other side of a window, and I’m still amazed he posed so prettily! LOL. I hope you weren’t eating walnuts, Debbie. He sure is interested. I can’t eat nuts, John, so no, he wasn’t looking at anything in my hand. Other than the camera, of course, and he did seem fascinated by that. Maybe it was his first “portrait”?!! He might have been enamored with the photographer. At least one standing up. Thanks so much for the pic, my friend. Really enjoyed it. Have a great rest of your week. P.S. love the quote too! Isn’t he darling? I love his little black nose and his black paw (obviously, he’s been digging in the dirt and storing up his winter food supply). And I know you can’t tell from this photo, but he was just a baby! For a while, I wondered how he was going to get down from this second story window, too. I didn’t see his parents around, but I guess he found a tree to hop onto. Dear Dallas missed this one — it was in the unfenced front yard! Dallas can chase them to his heart’s content in the fenced backyard, ha! I didn’t see him climb up to this window ledge. He probably leaped off one of the branches of a huge nearby maple, dropped onto the roof, and patted his way down. Clever little guys!